Its elegant look, watchful and confident poise, unquestionable courage and loyalty, remarkable athleticism, and a highly intelligent mind make the German shepherd one of the best breeds in the world. The GSD requires the right nutrition in the right amounts to make sure that it grows healthy and be able to carry out its true essence in this world. And if you happen to have a GSD at home or are entertaining the idea of bringing one home, here’s a list of the best dog food for German shepherds you may want to start with. 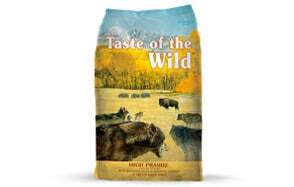 Taste of the Wild remains a favorite as the best dog food for German shepherds because of a variety of reasons. First, it has just the right levels of calories to meet the energy requirements of many of today’s GSDs. Second, it uses a variety of novel proteins like buffalo meat and lamb while still relying on the protein-richness of chicken as a tertiary ingredient. Third, there are other novel proteins in the mix like roasted bison, ocean fish meal, and roasted venison to make this German shepherd dog food bursting with meaty flavors. Fourth, it’s got a unique blend of antioxidants, gut-friendly microorganisms, immune-boosting nutrients, and coat- and skin- health-promoting molecules to provide all-around health and physiologic benefits for your GSD. Fifth, it doesn’t contain any of the ingredients that cause worry in many pet parents. You’ll never go wrong with the high protein, moderate calorie formulation of TOTW’s High Prairie German shepherd dog food. With a large ‘German Shepherd’ printed on its label, it’s difficult to miss this German Shepherd food from your vet’s clinic or even favorite pet food store. It’s the perfect meal for GSDs that are not as physically active as they should be since it comes with a lower calorie content than most other German Shepherd diet formulations in this list. However, do take note that its first ingredient is brewer’s rice. It also includes corn gluten and wheat gluten meals.. 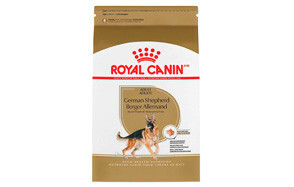 But if you don’t have any issues with such allergenic grains, then the Royal Canin German Shepherd is for you. Besides, it does have chondroitin, glucosamine, DHA, and EPA to help enhance your GSD’s vital physiologic processes. 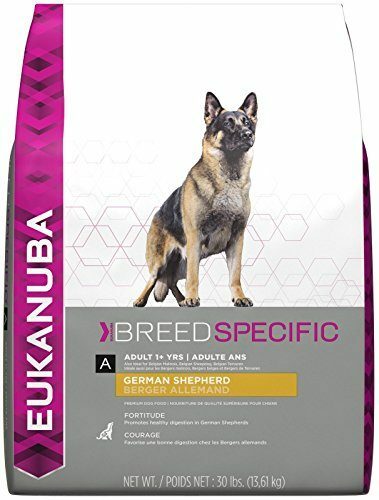 Formulated specifically for GSDs, the Eukanuba German Shepherd dog food comes with a unique blend of chicken, brewer’s rice, sorghum, and fish meal to give your young GSD the right amounts of nutrients that it requires for optimum nutrition. 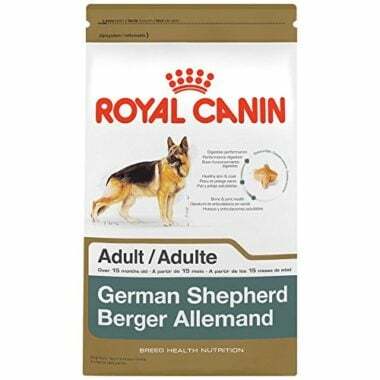 Like the Royal Canin formulation, this German shepherd food is perfect for those GSDs that require less calories as can be seen in those with a strong predisposition for obesity. It also comes with reduced-fat content, utilizing instead the richness of fish oil in terms of essential fatty acids. Eukanuba stakes its claim as the best food for German shepherd because of its low-calorie, average-protein, and low-fat content, but mostly because of the inclusion of glucosamine and chondroitin. Looking for the best food for German shepherd puppy? Hill’s Science Diet has the answer. 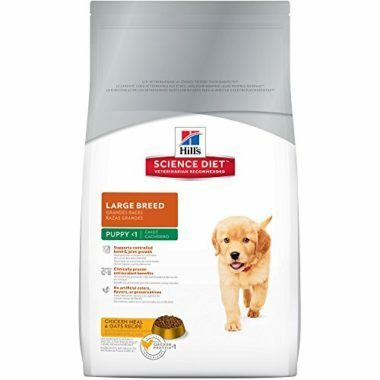 Its Large Breed Puppy formulation features the right mix of proteins and fats to help your young GSD grow and develop to its optimum. Putting chicken meal as its first ingredient, one can always feel confident that young GSDs will have the right amounts of proteins in easily digestible forms, paving the way for stronger muscles and more efficient immune system. This German shepherd puppy food features a nice blend of DHA-rich fish oil, antioxidant-filled fruits, and complete essential amino acids. Its perfectly-sized kibbles should really make it easy for young pooches to feast on their meals easily. 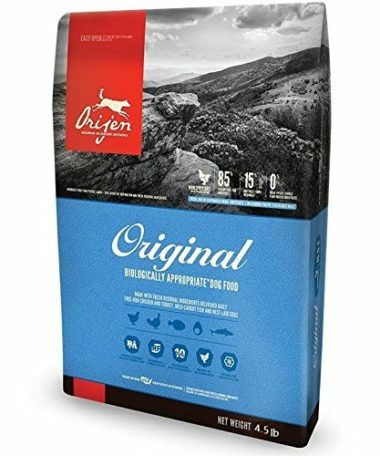 With 85% of its dry ingredients consisting of animal proteins like chicken, turkey, yellowtail flounder, Atlantic mackerel, and whole eggs, among others, this Orijen Original could very well be the best food for German shepherd. Only 15% of its ingredients are vegetables and fruits and absolutely none from grains, plant proteins, and even high glycemic potatoes. Because of its unique ingredient composition, this Orijen German shepherd dog food provides the highest protein content. It’s the perfect diet for the muscular and highly athletic GSD. However, if you’re not really training or exercising your pet, you may find that this formulation may not be ideal as your GSD may be prone to obesity. At the very least, you’re also giving your pet chondroitin, glucosamine, essential fatty acids, and a rich blend of probiotics to help combat any predisposition for gaining weight. 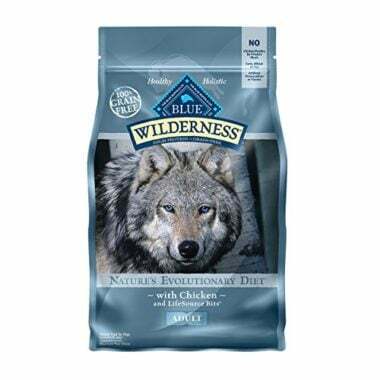 Utilizing the goodness of chicken, this German shepherd food from Blue Buffalo provides the energy for the highly-active GSD in your life. Empowering your GSD to live to its fullest is a bevy of all-natural ingredients that use healthy lentils, wholesome veggies, and antioxidant-rich fruits. It also takes care of your German shepherd’s coat and skin, thanks to the inclusion of menhaden fish meal giving your pet the EPA and DHA it needs. The formulation of this German shepherd diet makes full use of the various probiotic organisms known to improve not only a dog’s digestive system, but also its immune functioning. It doesn’t contain wheat gluten, corn, soy, and other allergenic grains, although it’s quite surprising chicken is still its principal ingredient. Nonetheless, the combination of high protein and moderate calories makes this a good German shepherd puppy food. With salmon and lamb providing additional delectable flavors to this already-delicious chicken recipe, the Superfood Plate is one excellent choice for a German shepherd diet. 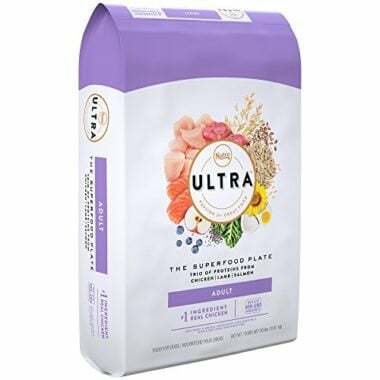 Like most of the contenders for the best dog food for German shepherds, this Nutro ULTRA formula comes absolutely free of wheat, soy, and corn. Instead, your GSD will get wholesome rice and oatmeal providing the base for a mix of botanicals, fruits, and vegetables. These supply your GSD with the right amounts of minerals and vitamins to support its various physiologic needs. Its low-calorie, moderate-protein formulation is ideal for GSDs that don’t get the amount and intensity of exercise that they should, freeing them from the risk of obesity. 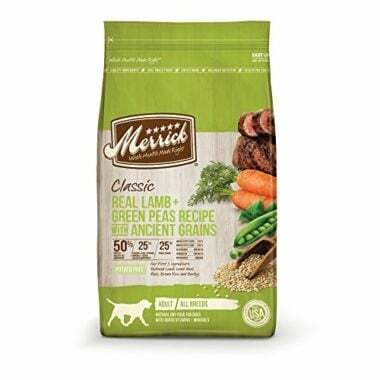 Giving your GSD the Merrick Classic is like letting them feast on a meal that best characterizes the best ingredients of the farm. With apples, carrots, and blueberries nutritionally supporting the formulae’s base ingredient of lamb this German shepherd dog food should do the trick in making sure your pet grows into the best GSD that it truly is. It may not have very high protein content, but it makes up for it by the inclusion of omega-3s and omega-6s as well as a handful of prebiotic ingredients to provide your German shepherd with an interesting mix of antioxidants, anti-inflammatories, immunoboosters, and cardio-enhancers. It is free from soy, wheat, and corn, too. 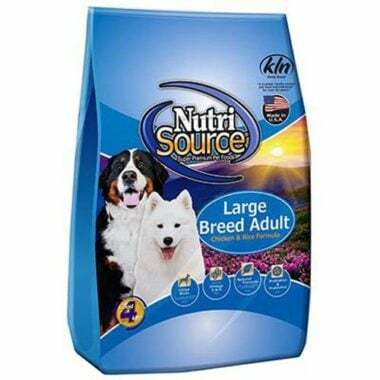 Designed for large breeds like the GSD, Tuffy’s NutriSource offers a different take on what the best food for German shepherd should look like. Its high-calorie, moderate-protein, and reduced-fat recipe should appeal more to pet parents whose hounds are exceptionally active. It’s completely free of soy, corn, and wheat, too; instead opting for barley and rice to give GSDs more readily available energy without upsetting their tummies. Further supporting their tummies are probiotic species that also enhance their immune functioning. 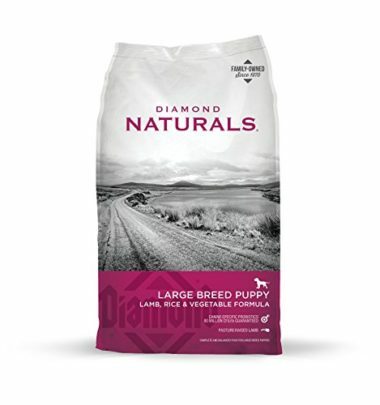 Diamond’s entry into this list of the best dog food for German shepherds is this puppy formulation that boasts of lamb as its principal ingredient. Vying for the position of the best food for German shepherd puppy, Diamond concocts a German shepherd diet that focuses in moderation. From calories to proteins and fat, one can consider the formula to be on the average. One can think that Diamond is playing it safe, although it wouldn’t really be beefing up its meal with probiotics, DHA, and L-carnitine if it only wants to be just like any other. When buying the best dog food for German shepherds, there are a few things you need to keep in mind. Adults, puppies, seniors, pregnant, and lactating dogs have very different nutrient requirements owing to the unique differences in their physiologic functions. Puppies require more calories and proteins while adults will require lesser of these. Seniors will benefit more from a high-protein, low-calorie, and low-fat diet, while pregnant and nursing GSDs may benefit more on a diet that closely resembles that of puppies. On the average, an adult GSW will require about 1,700 to 2,100 calories per day. This is your average active adult. But if your GSD works or engages in very strenuous exercises, this may have to be bumped up to 2,500 or 2,800 calories. GSDs with sedentary lifestyles will require about 1,200 to 1,500 calories. You need to consider your dog’s activity levels so you can check the most appropriate dog food in terms of calories for it. German shepherds may look formidable, but they’re actually prone to a host of health problems such as hip dysplasia, bloat, obesity, degenerative myelopathy, spondylosis deformans, lupus, and pancreatic insufficiency, just to name a handful. As such these should always be taken into consideration whether in terms of its management or prevention. For instance, if you need to prevent hip dysplasia, glucosamine and chondroitin may be considered. Preventing bloat can be managed with probiotics. Immune-related diseases can be addressed with essential fatty acids, antioxidants, and even probiotics. All dogs require complete and well-balanced nutrition. This includes the German shepherd. Ideally, it has the following nutrient requirements. A GSD is highly valued for its athletic, muscular appearance. This can only be achieved if you give it dog food that is rich in animal proteins. 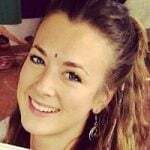 Plant proteins may also be given; however, as these don’t contain some essential amino acids, they should be given as backup sources of proteins. Animal proteins provide the most complete essential amino acids which are the building blocks of almost everything inside your GSD’s body. When plant proteins are given, you may have to supplement it with other amino acids. Fats are important for the maintenance of the integrity of the cells and tissues, the production of hormones, and the promotion of optimum skin and coat health. Of particular importance are omega-3 fatty acids, especially DHA and EPA. Omega-6 fatty acids like linolenic acid are also important. However, the ratio between omega-6s and omega-3s should be as close to the ideal ratio of 4:1 if not 1:1. If there are more omega-6 fatty acids there’s a tendency that inflammatory changes may be triggered instead of prevented. GSDs require energy especially if they lead a very active lifestyle. Carbs are the principal source of readily available energy in food. However, this should not comprise more than 40% of the dog food composition. Carbs can provide fiber which can aid in normal digestion. While AAFCO doesn’t recognize these as essential micronutrients, your GSD can surely benefit from omega-3 fatty acids, glucosamine, chondroitin, and probiotic organisms. These work well with other mainstay nutrients like calcium, phosphorus, zinc, selenium, vitamin B-complex, vitamins A, D, and E, and ascorbic acid. Here’s a list of the ingredients that you should really avoid feeding to your German shepherd. Q: How many calories does my German shepherd need? A: Since German shepherds are classified as large dogs that can weigh from 60 to 90 pounds the NRC recommends feeding the adult GSD with 1,740 to 2,100 calories every day, divided into two meals. This recommendation is based on a physically active GSD. If your German shepherd is already in its senior years or leads a sedentary lifestyle, its daily calorie requirement can be reduced to 1,272 to 1,540 calories. German shepherds with joint problems like hip dysplasia are best placed on a low-calorie diet to help reduce its weight and lessen its impact on the already-compromised joints. Q: How often should I feed my German shepherd puppy? A: Puppies, in general, should be fed three to four times a day, depending on its age. For GSD puppies 12 to 16 weeks, they can be fed 4 times a day. Once they reach the 17th week, their daily feedings can be reduced to 3 times a day. By the 6th month of age, a German shepherd puppy can already be fed twice a day like an ordinary adult. Q: Does a certain type of food help with gastric bloat? A: Gastric bloat is a benign condition that can turn into a deadly complication without any warning signs. Several theories have been forwarded regarding the development of bloat. The rapid ingestion of food, feeding pets on elevated food bowls, drinking too much water right after eating, and getting a really strenuous exercise right after eating are some of the most common risk factors for bloating. When it comes to dog food that can help with gastric bloat those dog foods that come with probiotics offer the best chance of preventing and managing this gastric issue. Foods that contain gas-forming ingredients like cabbage, broccoli, kale, peas, lentils, and soy may predispose your pet to bloat. 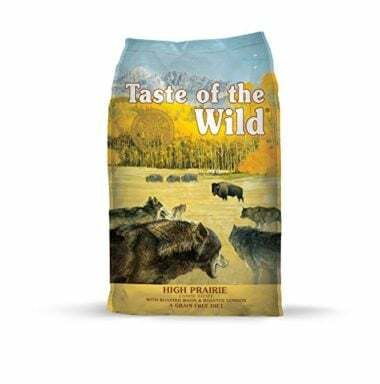 Earning the top spot in our list of the best dog food for German shepherds is Taste of the Wild’s High Prairie Canine Recipe that features buffalo, lamb, bison, venison, ocean fish, chicken, and beef as its sources of animal proteins. It has just the right amounts of calories so your GSD won’t be at risk for becoming overweight. It’s got chondroitin and glucosamine for joint health, probiotics for digestive and immune health, and essential fatty acids for skin, coat, heart, and brain health. These are the things that all German Shepherds need to grow healthy and reach their full canine potential. 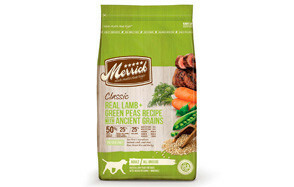 Caring for your German shepherd means giving it the best possible nutrition. While our choice of the best dog food for German shepherds may be on the pricier side of things, it nevertheless offers the best nutrition for a large wonderful breed like a GSD.